Bengeance: What Could Possibly Go Wrong? Life aboard a replica of a 15th century sailing vessel requires some odd hours. In particular, our departures from port often seem to come very early in the morning. And so it was that I came to be hauling myself blearily out of my bunk at 4:00 AM. I am not generally at my most alert at 4:00 AM, but I'll tell you this: nothing wakes you up faster than stepping out of your below-decks cabin, and into several inches of rushing water. I ran up on deck and found the captain, who greeted me with, "Ah, hi Ben, good morning," which I thought was a pretty relaxed greeting, given that as it turns out, he already knew the ship was filling with water, and did not yet know why. I suppose it's lucky that we happened to be getting up at 4:00 AM, or we might have sunk before anyone noticed. Later that day the captain installed a bilge alarm, which will now sound a 110 decibel siren if water starts to collect in the bottom of the ship. People come on board and tour these ships, and they basically all ask the same handful of questions over and over. One of those questions is, "What made you decide to do this?" I was answering that question, "It's an adventure," when captain Morgan walked by. (Yes... Captain Morgan. Please leave all jokes in the comments section below.) Captain Morgan has been doing this for close to 20 years now. I asked him, "Is it still an adventure for you, captain?" And he answered, "I really like boats." There was a pause, and it was clear that an explanatory addendum was forthcoming. 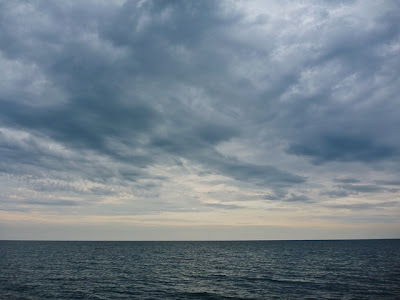 You know, maybe something along the lines of, "I love the beauty of the open water," or, "The freedom of sailing enlivens my soul," or who knows, maybe, "The sea is like a woman, and I am forever enfolded within her salty embrace." But no. What did he say? What was it that he offered as an explanation for his love of boats? "I just like to fix stuff." And there is always, always something breaking. Crossing Lake Michigan under engine power in a dead calm one night, the Niña's single engine died. 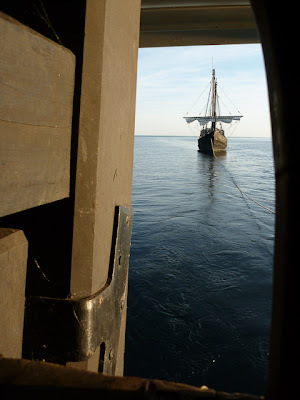 In the Pinta, we maneuvered alongside so that the Niña crew could throw us a line. This was much, much harder than it sounds, in the dark, with one ship drifting, and the ships' overlapping rigging threatening to tangle as we tried to inch closer together. When we finally got that line, we towed the Niña for five hours while the captain banged on the engine. And the list goes on. Leaving Kenosha, Wisconsin, the buntlines hooked on an overhanging dock crane, and ripped spectacularly away from the sail after yanking the yard askew. Water leaked through planks and shorted out lights below decks. 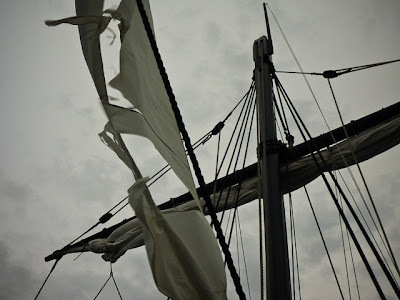 A halyard jammed, preventing us from lowering our jib in high winds, and the sail was ripped to shreds by the time we docked. A carelessly wielded chainsaw (don't ask) took a little chunk out of the deck. Big and small, enough things have broken or gone wrong in the short time I've been here that I wonder how it is the ships have made it this far, this long. I'd be tempted to say, "Never a dull moment," but I'm pretty sure it won't be more than a couple minutes before someone asks me, "So, what made you decide to do this?" Towing the Niña. Can you see that line stretched across the water? Out of sight of land on Lake Michigan. Oh yeah, that jib is done. 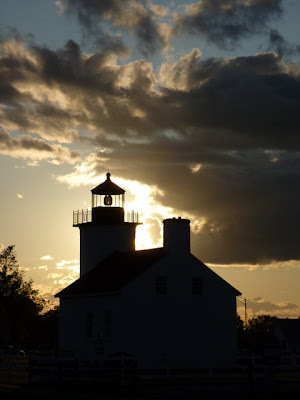 Of course no post about Great Lakes sailing would be complete without a picture of a lighthouse. Ben, I hate to point this out, but being a crewman on a replica Caravel isn't quite travelling the northern African coast. I guess your plans changed? I don't need to ask why you decided to do this. It's awesome. I do want to know how you got to do this, though. I have been reading for a while and was wondering. What is are you shooting on? Also thanks so much for the suggestion of the "Vagaboning" book in your side bar. Becky (my fiance) and I are really enjoying it!!! That lighthouse looks very familiar! "I really like boats." Hah! I like him. Well, clearly it's an adventure! And also great story material. But how do you like it so far? From the telling, your boat is more Petri Dish than Pinta. Come on, man! We *want* to know about the chainsaw. What other crew is there? Do they actually swear like sailors? Seems there's plenty to curse about. How does everyone get along? What do you guys do to pass the time? What kind of work do you do? What are your meals like? Are you able to shower on that thing? How often do you dock and mingle with the landlubbers? Any sea sickness? Is there a plank? A parrot? Peg legs or eye patches? P-p-p-pirates?! Dude, always so impressed with your writing and photography skills. Come out to Barcelona and we can find some trouble here! Keep sending the postings by email every once in a while! HA HA HA!!! Great!! Oh do I have stories for you. Meet you in Dakar. Great to read your posts. Good to know that you are in Michigan and not Africa. Check out Mackinac Island while you sailing in those waters. Zach: I'm glad you liked the Vagabonding book! I use a variety of cameras. All of the boat pictures I've posted so far have been shot using the Panasonic TS1. It's totally decent, and the shockproof and waterproof aspect of it makes me very comfortable using it on the boat. Plus it fits in my pocket. Most of the other photos were taken with my Sigma DP1, but I don't pull that out too often on the boat... so many ways to get damaged. Chuck: OK, geeze, that's a whole post in itself. I'll try to get to that. Gaelyn: Thanks! Hope things are going well for you in Barcelona. Anne: You owe me an email. Have you made it out of Burkina Faso? Maneesh: Glad you liked Vagabonding as well! It is a pretty great book. Hope you're doing well in good ol' SF. This is the first time I've actually been able to read your posts about the ships. I love them!! I wish I could have been there for the chaos.